Recently we met Asia Lanzi, thanks to OZ Bologna’s manager, Caloger “Lillo” Passerello, who founded this amazing action sports centre just a few steps from the walls of emilian regional capital. Inside OZ there are various sports areas with courses for each level and among them we also found a wide indoor skatepark. Thanks to Lillo we also met Gabriele Lanzi, Asia’s father and the reference figure behind the making of Eden skatepark, Bologna’s skaters’ little Heaven. Even though she’s only 14, Asia already has clear ideas about her future and her main passion: the young skater doesn’t limit herself to being the best in Italy,but she already has participated in several European contests obtaining great results, including an excellent fourth place in Prague. When she grows up, Asia wants to become a pro skater, and she has got all it takes to become! Thanks to her sponsors, Vans, Murder, Eden, Massa Nervosa and Facciosnao, and above all- her family- the teenager can skate 365 days a year and constantly train in order to improve day after day her skills. 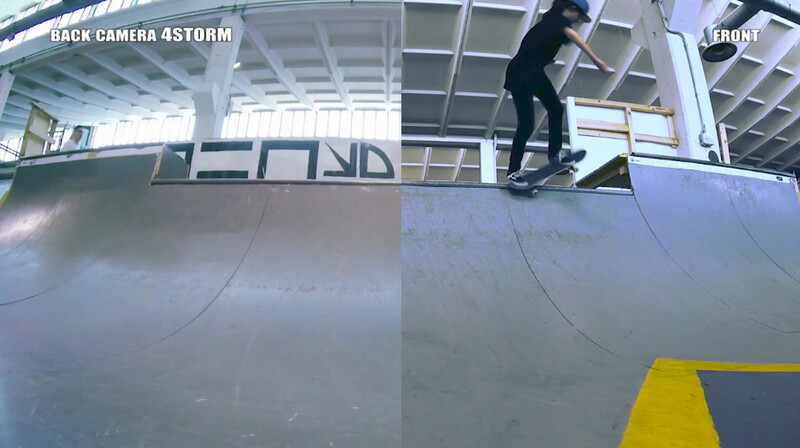 In this interview’s video we exploited the use cases of our 4storm camera to show the doble lens’s utility in skating context: thanks to the “2-in-1” action cameras 4storm allows to make a simultaneously front-rear shooting, so you can capture your tricks to 360 degrees. Our action cam’s double lens can be oriented from 0 to 90° along the same axis, so you can capture your moves before and after the maneuver, you can do an Ollie over 4storm and invent many original shootings even when there is no video maker to do it, by simply placing the sports cam on the ground. We will son show you more about our 4storm, the action cam ideal for any kind of action sport! Stay tuned to receive the latest news about our product’s presentation and to discover how to get exclusive discounts just by subscribing to our newsletter using the form above.